If you're looking for the best accommodation in Ella, then look no further. We've put together our top choices with a range of budgets to suit everyone! 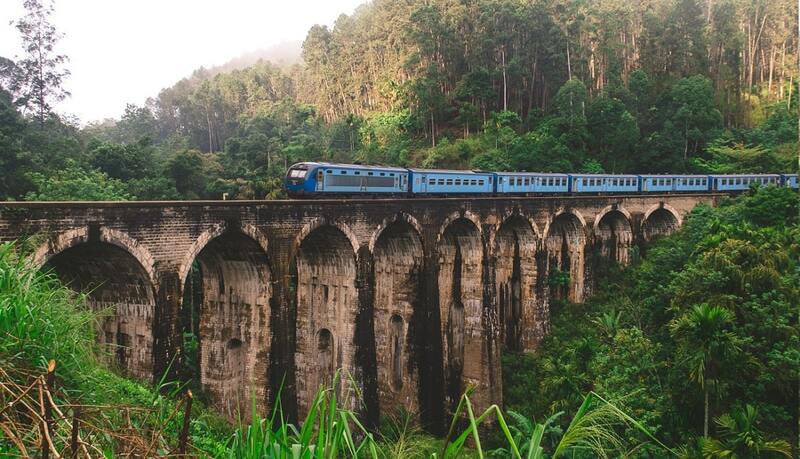 Oh, Ella, such a beautiful area of Sri Lanka. 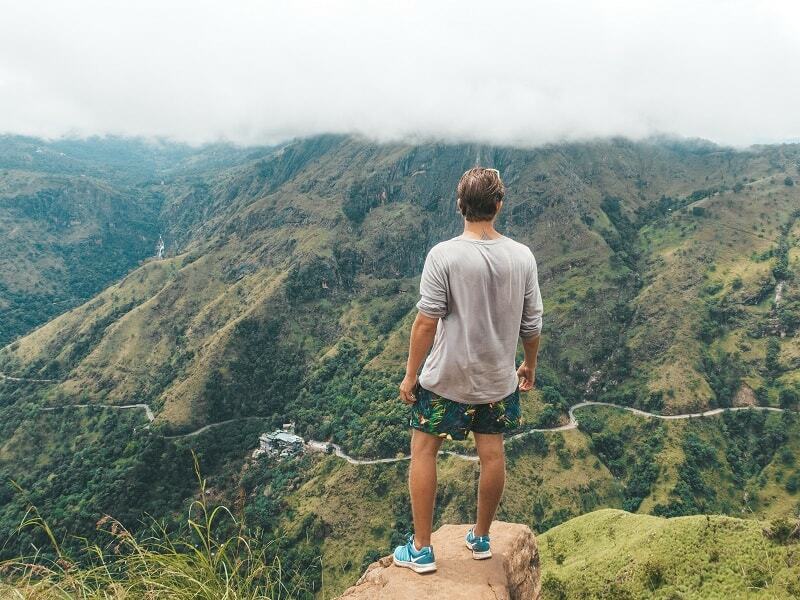 Known as part of the Hill Country in Sri Lanka, Ella has become a popular backpacking destination, and it’s no surprise why. But, if you’re looking for the best accommodation in Ella to compliment your stay, then you’ve come to the right place. All these accommodations in Ella will also be rated via their booking.com rating because that’s the website Brad and I always use when travelling across the world! The breakfast is amazing, the portions are huge and the food delicious. Probably the best I’ve had in Sri Lanka. One of the owners is a tuk-tuk driver, so they can give you a lift, and you can rent bikes from the property for free to explore Ella. Cost: A double room with breakfast starts at £14 per night based on 2 people sharing. The View, Ella does exactly what it says on the tin and provides you with a beautiful view of Ella. The view itself makes it a fantastic choice of accommodation in Ella. A delicious breakfast is included, and you can even opt to include dinner in your booking. A private bathroom is included and free Wifi is available. A swimming pool is also available at this property to take a refreshing dip after a day of seeing the best sights Ella has to offer. Homestays are a great way to get to know local people and gain local insights into the area or Sri Lankan life in general. Therefore, I recommend this homestay as a second option to the one we used above. Featuring a garden and terrace, this is the perfect place to base yourself in Ella. All rooms offer a private bathroom, and kettle and some rooms have a balcony view. Breakfast is also included and it rated highly with Asian and English options. 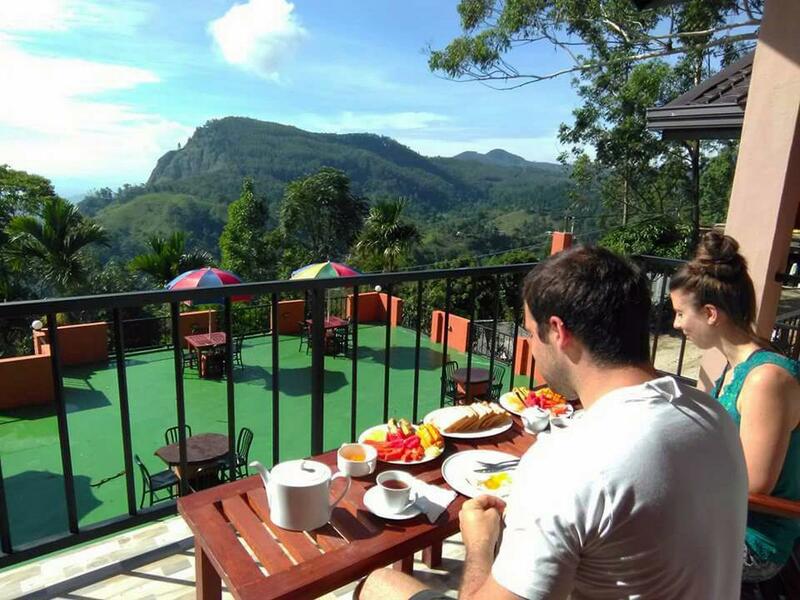 If you’re looking for a comfortable spot, with a view and a great breakfast, then this is the perfect accommodation in Ella for you! Looking for a dash of luxury? 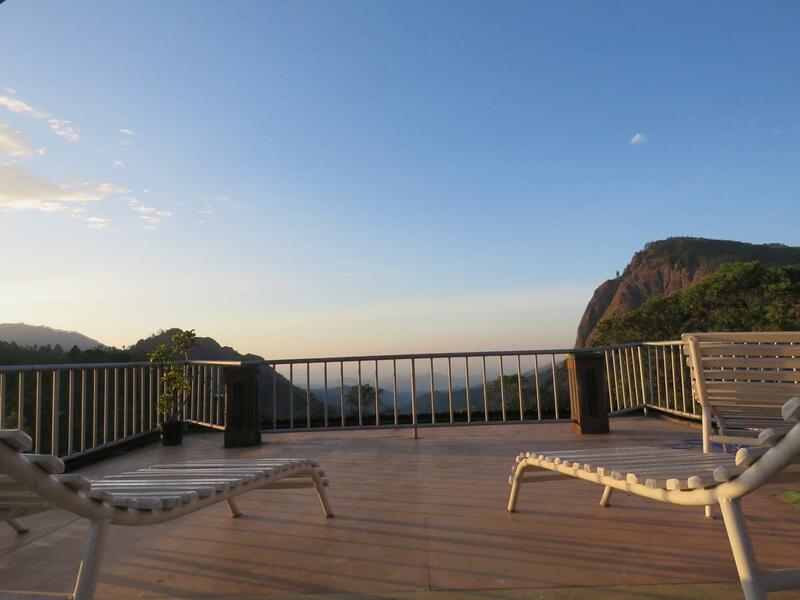 Then a stay at Zion view could be your perfect choice of accommodation in Ella. This hotel offers beautifully decorated rooms with private bathrooms and beautiful views of the countryside of Ella. A delicious breakfast is included and you can even enjoy the onsite massages and yoga facilities. This three-star hotel is another dash of luxury for those who are looking to splash the cash in Ella. Ravana Heights is located 1,000 m above sea level meaning it boasts stunning panoramic views of the coastal plains. The resort also has an on-site restaurant with bar. 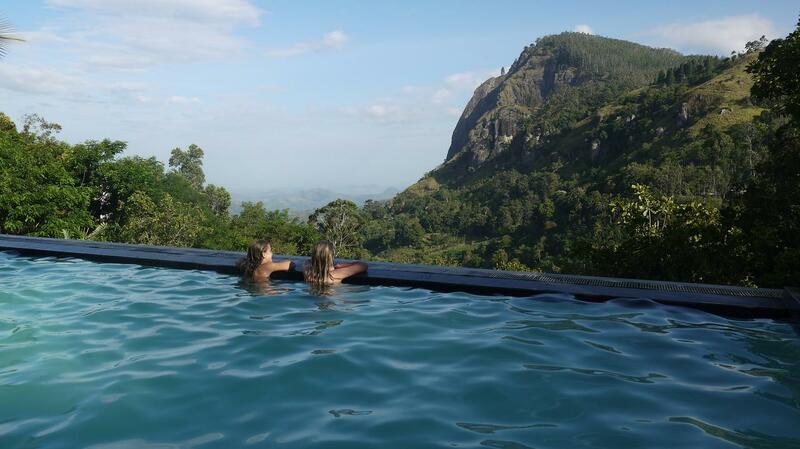 Some rooms offer views of the beautiful Ella Rock. Breakfast is included and is rated highly. Personally, I think this place looks amazing as far as hotels go in Ella, and if I was on a higher budget, this would have been my choice of accommodation in Ella. Maybe next time, eh. This is a great value option of accommodation in Ella, and it was one Bradley and I almost chose to stay in (we tossed a coin because I couldn’t decide!) 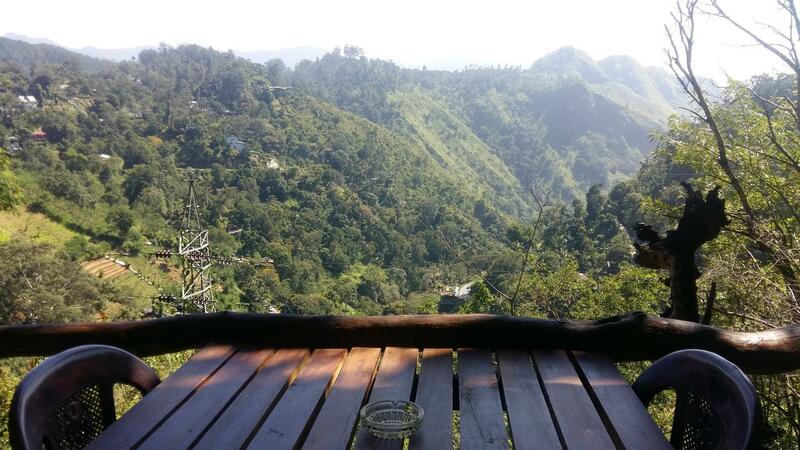 Situated on a hilltop, this guest house offers beautiful views of Ella. Each room has a seating area, and there is a shared kitchen you can use. 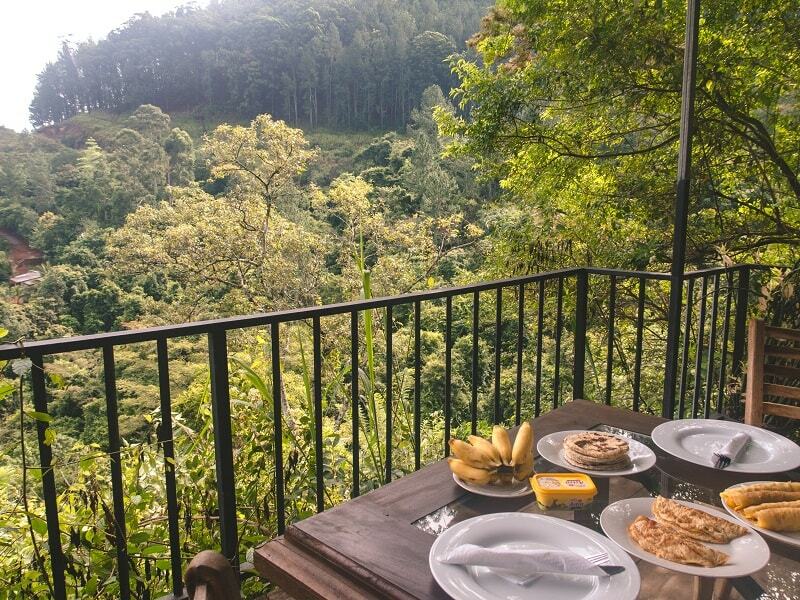 Breakfast is included, and the views with breakfast look great. 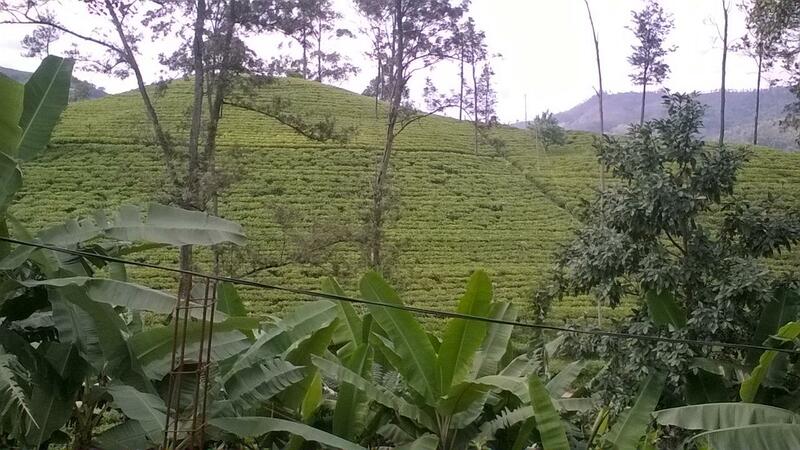 If you’re in search of views of the beautiful tea fields Ella has to offer, then this is the best place to stay in Ella. Rooms are functional, basic but do the job, and all come with a private breakfast. A full English breakfast is also available. I think you’re paying for the view at this place, but the high ratings can’t be wrong! 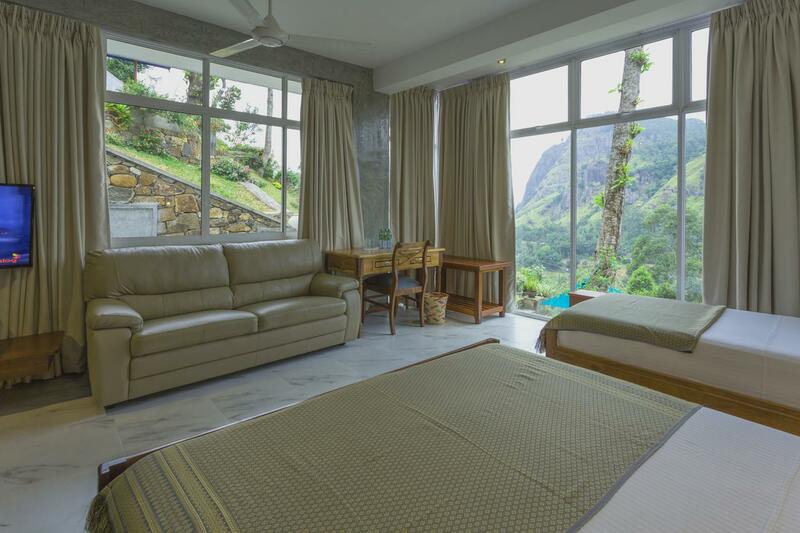 Rooms can come with a mountain and tea field view and some rooms featuring a seating area for relaxation after a busy day of sightseeing. This one is for the backpackers at heart! 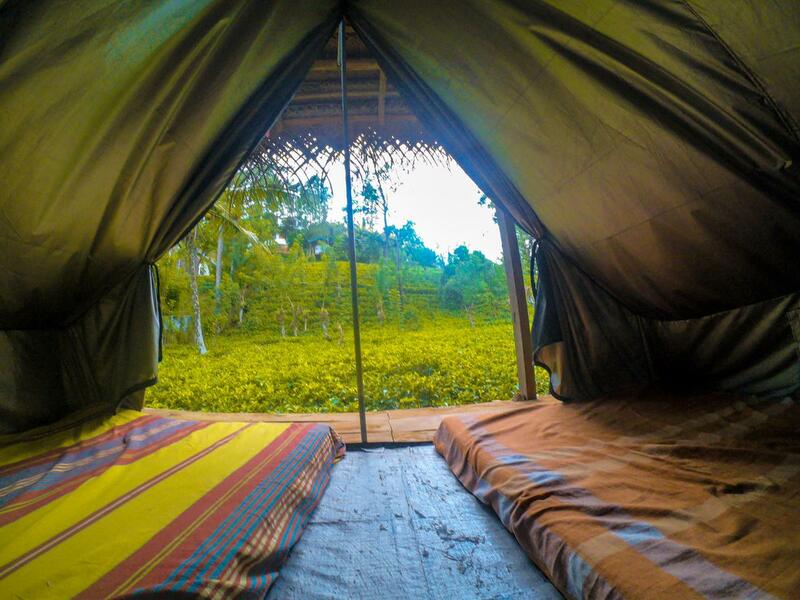 If you want cheap accommodation in Ella with a high rating and a different experience, then this is your choice. Camp under the stars of Ella in your own tent in this paradise. With a backpackers vibe and opportunities to people fellow like-minded people, this is a great place to meet new friends. A kitchen is provided so you can whip up some breakfast or dinner. Or you can take advantage of the breakfast that is served each morning. There is also a garden for relaxation. Last but not least, is the wonderful Ella Red rock. This cosy and comfortable hotel offers stunning views of the mountains, and you can have your breakfast or dinner surrounded by these views. Rooms are cosy and clean, and you can even rent your own chalet, which looks amazing. Breakfast is available for an additional fee. Cost: prices begin at a reasonable £34 (less if you’re a booking.com member- 24) per double room and 30 for chalet based on two people sharing. What are the best places to visit in Ella? Now you’ve got your accommodation in sorted, you'll want to know what the best things to do in Ella are. Well, thankfully we have an awesome post filled with everything you need to do whilst in Ella. But, to get you started, I’ve listed my favourites below. When is the best time to visit Ella? The busiest period if July, August and September, so it will be more expensive then, but Bradley and I visited in October and we had a wonderful time. The temperature is pleasant and everywhere is still open with a good vibe. It does rain, most days from around 2 pm or 3 pm, but it usually stops in the evening. The rain won’t bother you because it gives you a reason to get up early and sightsee, then relaxes when the rain falls by grabbing some food. The prices are also cheaper in October! But, I’d say Ella is suitable for visiting all year round. Why use booking.com for Ella accommodation? Well, because it’s the best. We use it all over the world, and when you become a genius member (after you book 3 times), you get little perks, like 10% off, free early check-in and late checkout, free breakfast, welcome drinks and much more. Also, booking. Com do a deal where if you find the accommodation cheaper elsewhere, they will refund you the difference so that basically means, it’s ALWAYS cheapest on booking.com. Not even cheaper to go direct. So, that’s why we use them! Ps, if you are on a honeymoon or anniversary, then a stay at the 98 Acres resort and Spa might be up your street…. If you’ve stayed in any of these places, or you’ve got other accommodation in Ella to recommended, then comment below so I can add them in.